Apparently, the UFC couldn’t care less about “The Walking Dead” season finale. 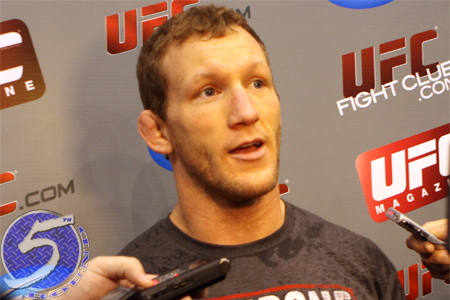 On Sunday evening, the organization announced a lightweight affair between Gray Maynard (Pictured) and Clay Guida will headline their fourth show on FX. The 155-pound shootout will be a five-round affair. The June 22nd event will take place in Atlantic City, New Jersey, however a venue has yet to be confirmed to host the shindig. Both veterans are looking to rebound from losses. Maynard was put to sleep by then-champion Frankie Edgar at UFC 136 this past October. The last time “The Bully” entered the winner’s circle was in a lopsided unanimous decision victory over Kenny Florian in August of 2010. Guida most recently dropped a decision defeat to Anthony Pettis at “UFC on FOX 1.” “The Carpenter” had rattled off four straight wins prior to the November outing. Although the organization has yet to make an official announcement, the trusty rumor mill suggests “UFC on FX 3” could go down June 8th.